Many of you who were my clients in couples therapy gave permission for me to video your sessions. My mentor at the reputable Gottman Institute reviewed some of the videos and guided me on how to improve my interventions. 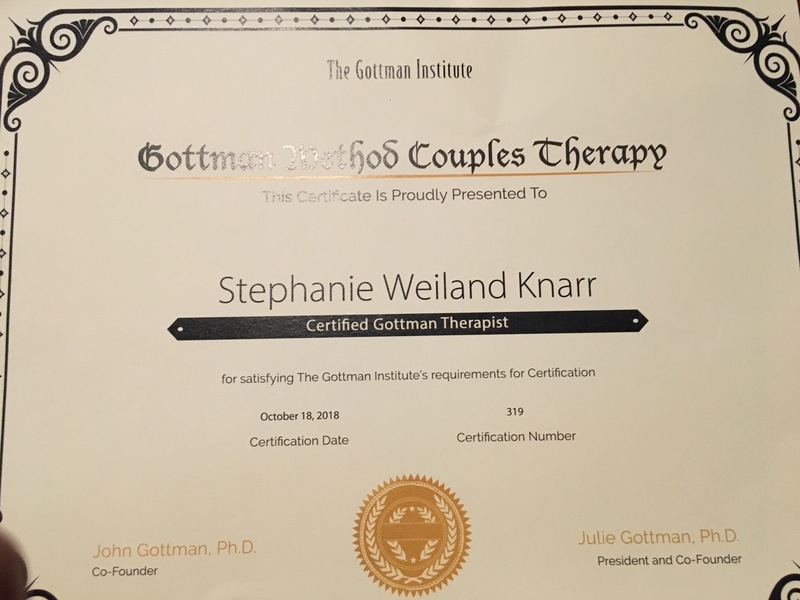 Along with video review, I just completed all the requirements to be a Gottman Certified Couples Therapist!!! To accomplish this goal, I had to complete 8 days of classes, attend 10 hours of mentoring and video review, and document practicing Gottman interventions during over 100 hours of clinical work. I am thankful to my mentor Dr William Bumberry for giving me lots of great feedback on how to improve my skills as a couples therapist. Even after 15 years of practicing full time as a licensed marriage and family therapist, there is always room for improvement! I learned a lot, in particular how to apply Gottman’s research about what predicts divorce versus what predicts a successful marriage to the couples I am a clinician for. My next steps are to improve even more at helping clients with creating a solid Sound Relationship House. I am also planning to learn how to present Weekend Workshops and Retreats for the Gottman Institute, and I hope to become a trainer as well! I also have an idea for the Gottmans regarding how to help couples reduce defensiveness and accept responsibility. Many of you have experienced using the metaphor of a customer service counter for your relationship as a way to respond to complaints in a non-defensive way. It will be interesting to see if this idea or metaphor will be something that the Gottmans like… I will keep you posted!!! Seminar to Improve Your Relationships – Register Now for May 18!!! Dr. Stephanie Weiland Knarr is a nationally known relationship expert. Stephanie provides keynotes, motivational speeches, and seminars for couples, families, business and government audiences. Quoted in Forbes, Time, and MSN, Dr. Stephanie provides expertise regarding communication, conflict resolution, and interpersonal relationships both at home and in the workplace. Stephanie has extensive history providing employee assistance counseling and workplace seminars in the Baltimore Washington region. Join thousands of people on my e-mail list and I will send you my FREE E-book: Two Chapters you can sample from my book Relationship Repair for Couples. You will receive a weekly newsletter with relationship tips for your personal and business life, opportunities to attend FREE webinars and live events, and chances to enter contests and prize giveaways!